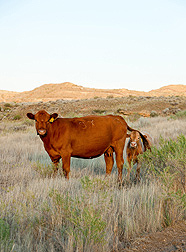 A cow and calf in an ARS feed-restriction study on the Upper Lignite pasture at Miles City, Montana. Feed restriction may lower the costs of developing replacement heifers and extend their lifespan. U.S. consumers love beef. We eat an average of about 63 pounds of it per person each year. Producing enough cattle to meet that demand requires efficiency and innovation. Agricultural Research Service scientists at the Fort Keogh Livestock and Range Research Laboratory (LARRL) in Miles City, Montana, are conducting studies designed to make cattle production more efficient and to provide better beef products for consumers. Attaining those goals has led to strategies and technologies for reducing the cost of beef production, including more efficient nutrient use and improved reproductive performance. Reducing production costs hinges on maintaining high rates of reproductive success while reducing use of harvested feeds. A common problem that U.S. cow-calf producers face is low rebreeding performance among 2- and 3-year-old cows. This occurs when the cows’ needs for additional nutrients during pregnancy and lactation have not been met. But rather than just feed young cows more, the LARRL scientists are attempting to make them more efficient so they’ll need less feed. 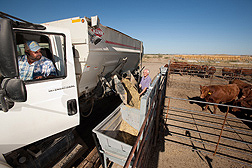 Animal feed is a large part of beef producers’ costs. Cereal grains—often used as a major part of heifer (young female cattle) diets—are becoming less abundant and more expensive because they are in higher demand for human food and ethanol production. Feed represents about 50 to 55 percent of total costs of developing replacement heifers. According to animal scientist Andrew Roberts and colleagues, heifers they studied developed to target weights lower than those traditionally recommended, consumed 27 percent less feed over the winter months, and gained weight more efficiently throughout the postweaning period and subsequent grazing season. “The strategy of providing less feed may reduce costs of developing each replacement heifer by more than $31 and extend their life span, with important ramifications for lifetime efficiency and profitability,” says Roberts. At Miles City, Montana, animal scientist Andy Roberts identifies a calf in a study to reduce beef production cost prior to weaning. In their study, heifers (50 percent Red Angus, 25 percent Charolais, and 25 percent Tarentaise) were divided into two lifetime treatment groups: The control group was fed according to industry guidelines, and the restricted group was fed (on a body-weight basis) 80 percent of feed consumed by their control counterparts for 140 days, ending when they were 1 year old. The restricted heifers grew slower and weighed less at any point in time as a consequence of less feed. The actual amount of feed provided to restricted heifers over the entire feeding period was about 73 percent of that provided to the controls. Final pregnancy rates were 87 percent for restricted heifers and 91 percent for the controls. From breeding through late fall, the heifers were managed as one group. Each winter, the pregnant animals were again separated into two groups—restricted feed and control. The restricted cows were fed 20 percent less supplemental feed during the winter months than the controls. The scientists predicted that these treatments would allow nature to decide which heifers were reproductively efficient: Less efficient heifers would eventually fail to reproduce and be culled if restricted, whereas feeding more would keep them in production but result in more expense for the producer. 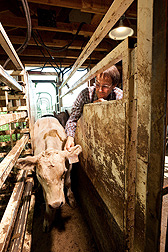 “Early elimination of inefficient breeders allows them to be harvested for the high-quality meat market,” says Roberts. Roberts and colleagues also found that restricting the cows at a young age might improve their efficiency throughout the rest of their life. The restricted-feed study has been ongoing since the winter of 2001, and the researchers are now looking at the second generation—those that were born from cows on restricted diets. “An interesting thing occurred: The feed restriction seems to have made the second generation able to withstand restriction with greater efficiency,” says Roberts. In cattle, maximum production (measured by weight of calf at weaning) doesn’t peak until 5 years of age. In the study, the proportion of cows that became pregnant each year and stayed in the herd until age 5 was greatest for restricted cows out of restricted dams. Restricted cows from control-fed dams had the lowest rate of survival to age 5. The researchers found that the third-generation feed-restricted calves are lighter at birth and at weaning than those calves from cows fed at the industry standard, but the feed-restricted cows themselves are slightly fatter and heavier at the calves’ weaning. “Physiologically, the second-generation restricted cow is conserving some of the nutrients taken in for body reserves, which may result in more efficient reproduction and better survivability in the herd,” says Roberts. Geneticist Lee Alexander (left) and technician Stacie Kageyama genotype calves and their parents with a DNA analyzer. Genotypes are used for research tasks such as confirming parentage, identifying locations of interest in the genome, and finding important mutations. Improving beef quality is another priority for LARRL scientists. Marbling—the streaks of fat in lean meat—has long been an indicator of palatability, and it serves as one basis for determining the price of beef. Marbling is an inherited trait and thus amenable to genetic improvement. Marbling is measured either at slaughter or by ultrasound of the live animal. Says MacNeil, “Cattle breeders would benefit greatly from having genetic indicators of superb marbling and other sought-after traits.” This is where geneticist Lee Alexander steps in. Alexander and his colleagues used a panel of molecular genetic markers to locate specific places in the genome that contain genes that influence traits such as marbling and fatty acid composition. 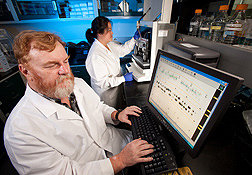 They looked at the genome of a Wagyu-Limousin cross population. These breeds were chosen because Wagyu is a heavily marbled beef, and Limousin is leaner. “Genetic markers successfully identified a region of the genome associated with the amount of marbling and relative quantities of saturated and monounsaturated fats,” says Alexander. Beef with the best flavor has a higher percentage of monounsaturated fatty acids. These results may lead to a better tasting and healthier product for consumers through breeding systems that lead to an improved fat profile in beef.—By Sharon Durham, Agricultural Research Service Information Staff. "Beef Cattle: Improving Production Efficiency and Meat Quality" was published in the January 2011 issue of Agricultural Research magazine.